The one question I am asked over and over is “How to boost energy - naturally.” I’ve spent years on this question! 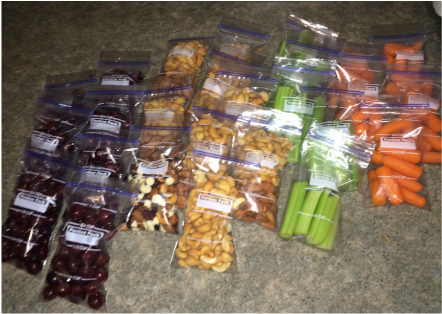 My own recovery from fatigue began in 2005 and now, some eleven years later, I do have some nutritional gems to share that will make your journey easier, faster and more enjoyable too. ​Mine rotates between the following basic menus. If you keep it simple, and these are simple, you’ll be more likely to eat better and feel better - FAST. Make sense? Lemon Water: First thing in the morning – before eating or drinking any juice or coffee - have a big fresh glass of lemon water. The lemon helps clear out toxins that have accumulated over night and over time. Tip: You always want to brush your teeth after breakfast and drinking lemon water because it can be harmful to tooth enamel. Water with Goji Berries: This is my refreshing all-day-long drinking buddy. Just add a half dozen Goji Berries into your daily glass or thermos and sip away. The Goji Berries are a rich source of antioxidants and one of my healers swears by their health benefits. Green Foods - Veggie Magma Drink: This is a powder you add to a glass of water. No matter how much green I eat I know it is never enough, or often enough. This is a sure fire way to exceed your daily requirements and is one of my favorite energy drinks! Licorice Root Tea: This herb provides excellent support to our adrenal glands. I also love the taste! Tip: Take any and all of these energy drink suggestions on the road with you. Not drinking enough water and drinking sweet, sugary drinks are not how to get energy … they are a means to make you feel tired and exhausted. Oatmeal: Get more energy out of this standard fare by adding a 50/50 mix of Sea Salt & Kelp Powder. I keep a small bowl of this mix next to my stove so I can easily sprinkle it on most anything I’m eating. Additional energy boosting foods to add into this meal include: walnuts, sesame seeds, flax seed and cinnamon. I sometimes add fruit and maple syrup, but sparingly to keep my sugar consumption low. Click here for Fatigue Be Gone Energizing Oatmeal Breakfast Recipe. Eggs: Enjoy them any way you like - fried, scrambled, poached or baked. Just add a tablespoon of chopped onion, a sprinkle of Parsley and Turmeric and a couple pinches of Sea Salt and Kelp Mix (See "Condiments" below.). Add a toasted slice of *Mestemacher Natural Rye & Spelt Bread topped with a generous spread of St. Dalfour jam. Peanut Butter on Toast with a spread of Jam and a side of small Banana: This is a super fast, on-the-go meal that boosts energy for hours. Again, I recommend that Mestemacher Natural Rye & Spelt Bread with Arrowhead Mills Organic Creamy Valencia Peanut Butter with St. Dalfour Deluxe Fruit Spread. i.e a piece of cheese with an apple. Protein: Wild-caught Fish or Free Range Chicken is the best option. Steak is also allowed, but less frequently as it can be high in fat. Buy organic grassfed as often as possible. It is more expensive but worth it. Click here for easy & affordable, energy-boosting recipes. Eat Your Greens: Enjoy a fresh Garden Salad or a create a Portable Salad Bar! You can keep it simple with a few greens and olive oil and vinegar dressing or you could make a portable salad bar like I did this week! Just open up cans of any vegetables you have in your cupboard. This week I opened cans of small peas, artichoke hearts, red beans, asparagus stalks and canned salmon. (Many were purchased on sale in the grocery "special offer" bin.) I put each item in a clear glass recycled jar and stored my "bar" on a tray in the fridge. It is easy to serve and easy to store. Remember, the faster it is to eat better, the faster you will feel better! Baked Potato Bar: Same idea as above and this is a crowd-pleaser! All you need are baked potatoes and a variety of "side" dishes. In addition to the above, add cooked beans, diced onion and diced garlic. Add a Soup: Click here for fatigue-busting soup and salad recipes. Small Apple with a stick of cheese, Laughing Cow, anyone?! ​The main condiment I use is Kelp Powder. The brand I prefer is the Starwest Botanicals Organic Kelp Powder. In addition to adding it to my food, I even add an 1/8 of a teaspoon of this mix to a couple of my daily glasses of water! This was a recommendation made by Dr. James Wilson, author, Adrenal Fatigue The 21st Century Stress Syndrome. Again, per my mentor, Dr. Wilson, I take 1 TBSP of Flax Seed Oil with 1 TBSP of Sunflower or Safflower Oil daily. This is an inexpensive and super easy way to add that essential balance of fatty acids into your day. It can also be used as a salad dressing, just add a couple drops of soy sauce for extra taste. ​Probiotics: If you have recently been on antibiotics, or have had heavy rounds of antibiotics in the past couple of years OR are prone to fatigue causing Candida, I always recommend twenty to thirty days of probiotics. Just take one capsule each morning before breakfast. Vita Living offers a great line of probiotics and digestive support supplements to help maintain healthy gut flora. Click here to view their product catalog. In closing ... well this is not a topic that ever closes! I encourage you to incorporate these basic menus and energy foods into your home and daily routine. If you are a chronic breakfast skipper you'll be amazed at the hours of energy you'll be adding back into your day. Chronic meal skipping, chronic carb gobbling, chronic dehydrating ... whatever your habit, and you probably have more than one or two, this is a great time start taking great care of your best asset - YOU! 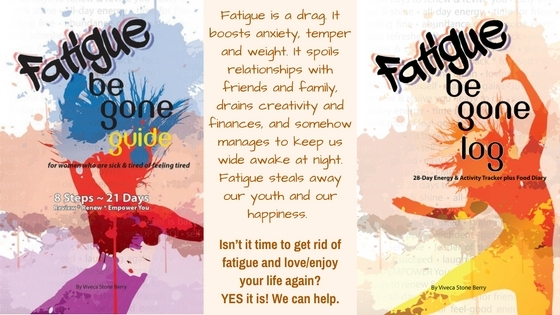 Please continue feel free to share your wins, concerns and your energy boost finds with me online at: AdrenalFatigueBeGone.com or via e-mail at: Viveca@FatigueBeGone.com. Love hearing from you!